CYBERMAXFM+ SE+ V2 200W/400W/600W/800W STEREO/RDS FM TRANSMITTERS! All our FM transmitters were finally upgraded, all SE+ models now come with large 4x16 LCD display and VU meter! SE+ lineup is based on our top of the line FM exciter (8015 series), SE8000 DSP stereo encoder and has a number of other improvements. Perfect for demanding broadcasters. This unit in large 2H 19" rack enclosure contains mains power supply and gives 200W/400W/800W/800W of RF power 24/7/365. Large heavy-duty ball-bearing 80x80mm cooling fans take care of any excessive heat. Transmitter is equipped with a stereo encoder with pre-emphasis circuit, DSP processing, active low-pass filter, our professional series PLL synthesizer, wideband no-tune RF stage with temp protection, good output RF filter and optional RDS processor. PC remote control is possible via USB, RS232 or Ethernet. A robust transmitter made for 24/7/365 operation. In our opinion the best quality/price ratio possible. All our manuals and software are available here. Note: SE transmitters are available in 2 versions. This unit has a DSP stereo encoder, making your transmitter stereo. Very shart input filters with a deep 19KHz notch, advanced signal processing with compressor and limiter, all adjustable via LCD display. The number of settings is indeed fascinating, you can also set gain for each audio channel, compression ratio etc. How much range can I expect? You can read more about range in this guide HERE. Radio Data System, basically it displays station name and sometimes song name and similar information on a compatible radio receiver. Very popular in Europe, less so in the US. Requires connection to a PC at the time of programming, but retains settings even when powered off. - This add-on card lets you connect this transmitter to the PC via Ethernet network. You can control and monitor the status of your transmitter over Ethernet or Internet. What is "Mobile phone remote control (SMS)"? Connects to the RS232 port at the back of your transmitter and enables remote control of the transmitters via GSM phone network. SIM card and contract not included. Commands and alarms are sent and received via SMS. An app exists for Android phones. What is replacement final transistor? You can buy this just to have a handy replacement transistor in case it gets damaged some time in the future, for example if there is a lightning strike. - A high quality mixer with telephone hybrids, such as this very popular unit. - Professional broadcasting microphone with noise-free stand, such as this one. - Your PC. Just plug audio cable into your sound card. Add SAM broadcasting. - Requires mains plug which can be purchased in your country (each country has a different mains plug and we don't carry all). This is standard mains plug and its price is typically around 1 US$ or less. You can get it in any electronics store, such as radio shack, circuit city, any computer store etc. Always use grounded plug for your safety! - You will also coaxial cable to connect antenna and transmitter, you can order it HERE (up to20m) or HERE (20-60m) or HERE (>60m). - Radio Essentials Kit contains various connectors and adapters plus an antenna analyzer, every stations should have these at hand at any time. - You will need audio source (mixer, cd player, microphone etc). 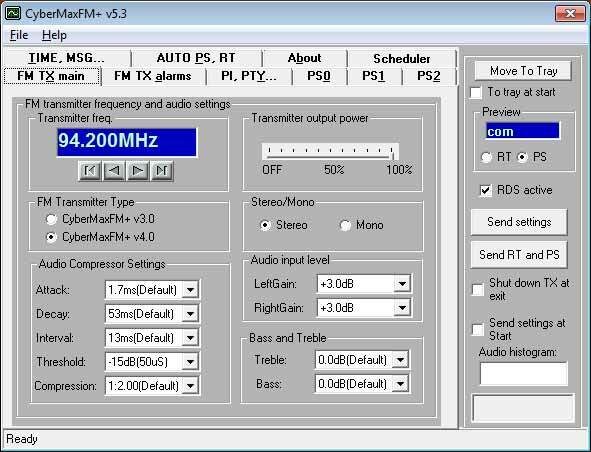 It is a good idea to use PC as audio source and run some kind of audio scheduling software, such as Jazler, Raduga or winamp. Winamp plugins such as rocksteady exist and can make your sound even better. 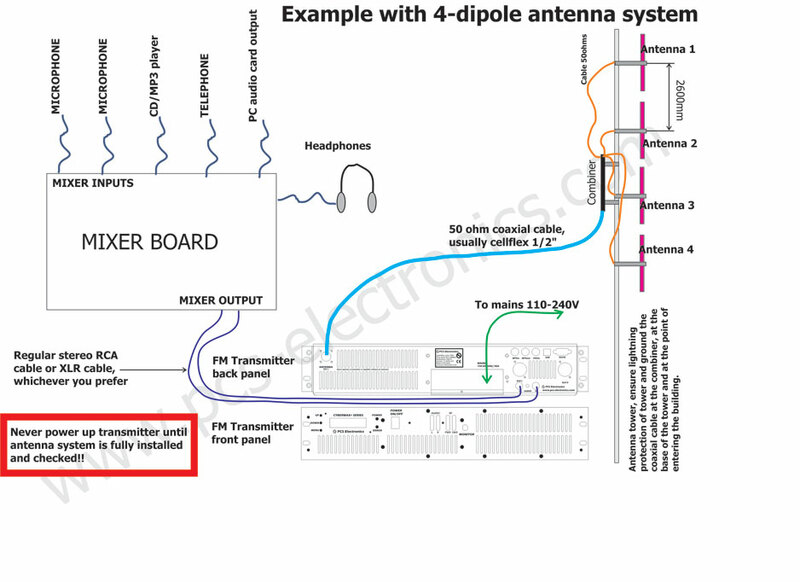 Where can I buy everything I need to start in a package, including antenna and everything else? You can check our All-inclusive transmitter packages, these include antenna, coaxial cable and mains power supply. 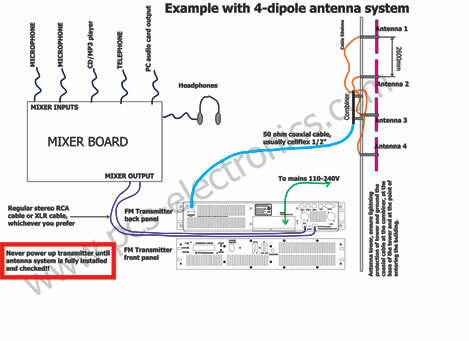 Another way to go would be to select your preferred antenna here and coaxial cable with connectors here, this way you can configure your own package. Depending on the model this unit gives ~ 1000W of clean RF power, exact power output can vary about +/- 10% depending on frequency, ambient temperature and antenna matching.